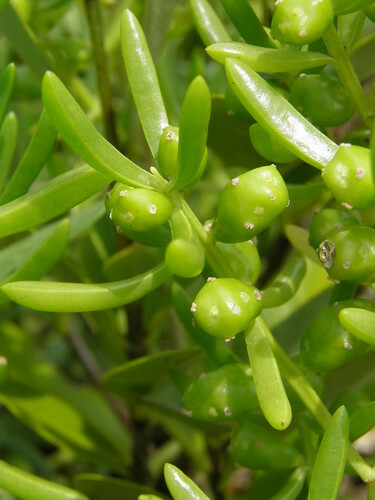 This native, sprawling, dioecious shrub is one of the most common halophytes found along our Florida coastline, occurring in most of our coastal counties. 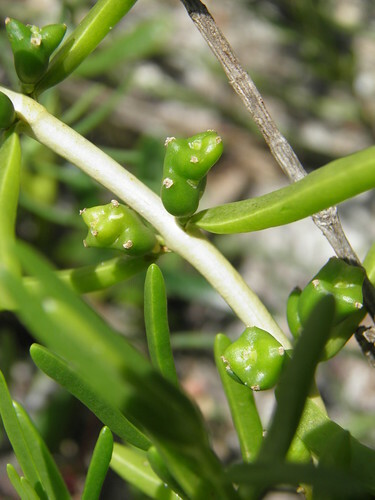 While strolling along mangroves, tidal swamps, and saltmarsh trails, keep an eye out for patches of light yellowish-green leaves - upon closer inspection, they might just turn out to be Saltwort. The salty, succulent leaves may be eaten out-of-hand, however, they are not my favorite beach trailside snacks, being a bit too fibrous for my liking. Try consuming the younger leaves near the tips first. 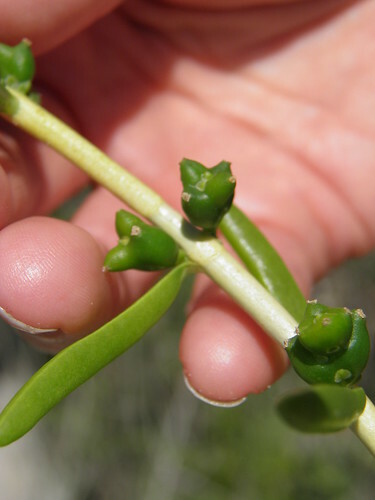 Dr. Howard, a co-author of Julia Morton’s book on Florida Wild Plants for Survival, recommends boiling and straining to remove “strings” to make a salty puree.” The very nutritious seeds have a "high oil content" and are edible in various ways, both raw and cooked. White-Tailed Deer nibble on the tips, and this plant is host to our Great Southern White butterfly. 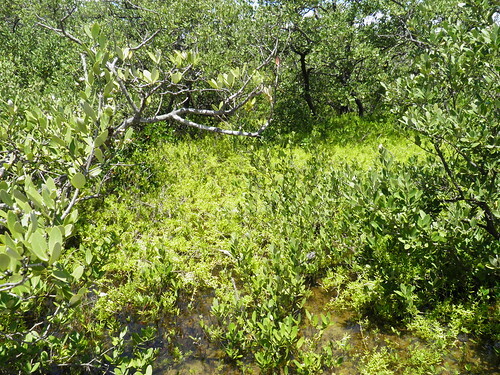 This native groundcover is sometimes planted after hurricanes to help restore coastal habitats. - PICKLED LEAVES: They apparently make good pickles. Use the younger leaves. - COOKED GREEN: The young leaves may be steamed or boiled. - SEEDS: Green Deane writes, "pepper-corn size seeds edible in salads, toasted, or “popped” like corn." - Oh my, I must experiment and get back to you. BUTTERFLY GARDENING: Planted in "butterfly gardens in saline areas along the coasts." The larval host for the "
NATIVE TO: "Southern United States south to the Monroe County Keys; West Indies, Mexico, Central America and South America." Florida [most, if not all, coastal counties]. It is invasive in Hawaii. ETYMOLOGY: Maritima = of the ocean. NOTE: Do not confuse this species with other plants also known as Saltwort, including......................................... ?Salsola genus? A very few native nurseries sell these as potted plants.